Back in January, I’ve decided to say ‘adios’ to my cable TV provider and “cut the cord”. As I have written about before, being a cord cutter is not that difficult as most of the movie and TV show programming is readily available from alternate sources such as iTunes, Boxee, Hulu, or directly from the TV networks’ sites. Most, except for live sports. I can live without live sports to a certain degree but that doesn’t stop me from trying to find non-cable solutions. Particularly, I like watching the Grand Slam tennis tournaments and so I have been pleased to see that the online coverage has been on the rise this year. 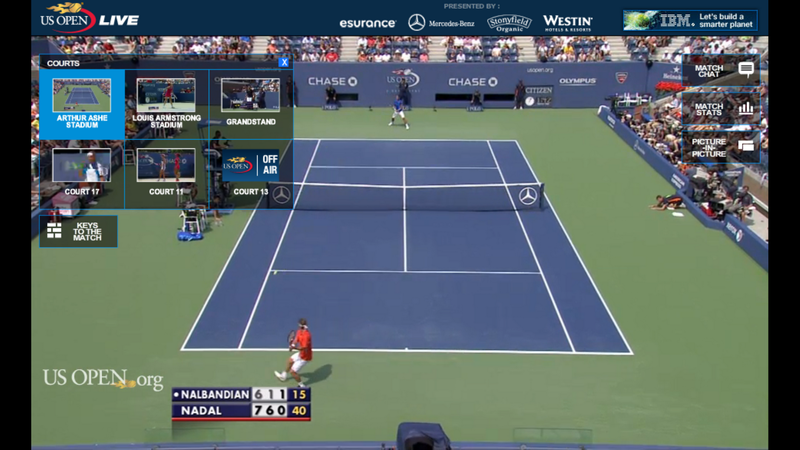 The current online live streaming coverage from the US Open, however, beats cable hands down. 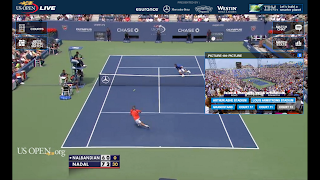 The US Open video streaming is offered free of charge, supported by relatively unobtrusive advertising, and delivered by IBM which is not a big surprise since IBM has been sponsoring major sports events this way for years. 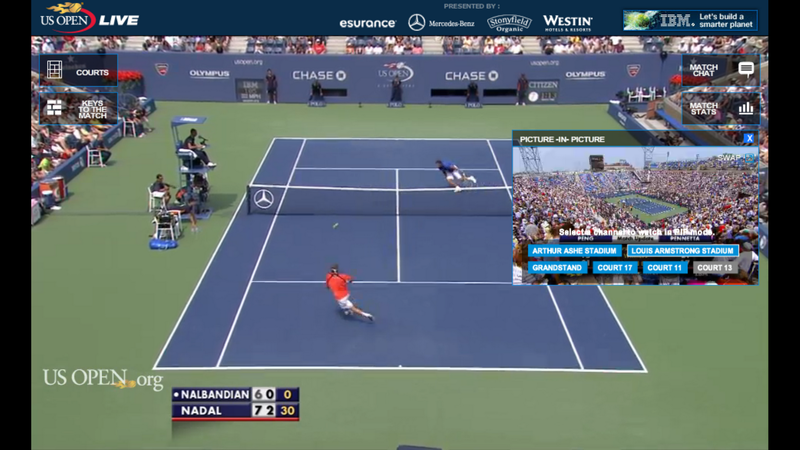 However, the capabilities of the video stream, which IBM calls the US Open PointStream, go beyond anything we’ve seen in the past. 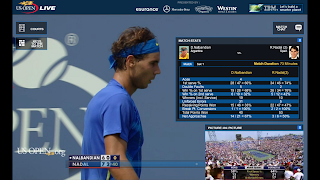 For example, PointStream streams all matches live and you can interactively select which match you want to watch. Your regular cable TV makes that selection for you and you are not always going to like it since you will inadvertently miss certain matches. 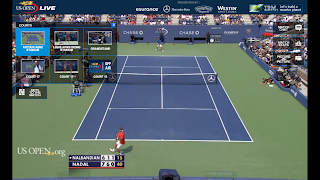 On PointStream, you are in charge of deciding which match you want to watch. In fact, if I want to watch two matches at a time, a picture-in-picture feature is available. PointStream goes far beyond that, though. With a mouse click, you can see the score results from all courts where play is under way. 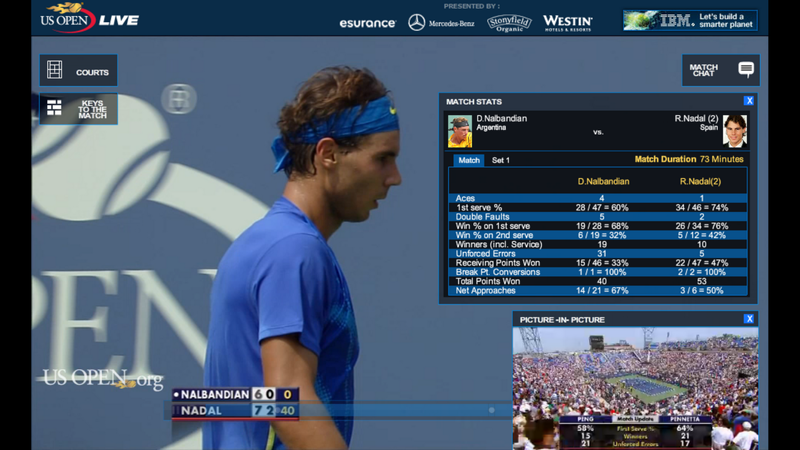 You can also see real time statistics and analysis for the match you are watching. IBM is effectively combining the video stream with a business intelligence type of analytics. You can pause the play or rewind it - features we all love from Tivo. You can engage in online chat with other viewers. This particular feature would have been much more useful if it was actually streaming the Twitter conversations related to the #uso11 hashtag, though. The bad part is that living in Canada, I had to VPN into the US to trick the system into believing that I am a US based viewer. That’s doable and I gladly pay for the VPN service but these artificial borders are infuriating. To watch the action on my big screen TV, I had to connect my iMac with the TV set via a 20 foot-long HDMI cable. That works fine although it is not a very elegant solution. I’d rather had the live TV streaming provided directly via my Apple TV. I hope Apple’s new CEO Tim Cook is already working on it. All in all, I am very impressed by what is possible today. I have an average speed Internet connection at home (8.1 Mbps according to speedtest.net) which gets further degraded by the VPN service (6.72 Mbps) and yet I am able to watch the action just like on TV. And with programming choices and features available, the experience is way better than the traditional TV. Yes, the future of interactive television has started. And I have a message to you, the cable and satellite TV companies - interactive streaming is what I want. Evolve or die! PS: Rafael Nadal won the match. Hey Lubor - in a move to a new house in Riverdale in Toronto we decided to cut the cable. It happens though that the one thing we want to be able to watch are the grand slam tennis tournies. Have you written a blog or know where there is one that explains how you VPN into the US to be able to get Open Pointstream?